Like any celebration, the festival of sacrifice is a time for sharing, helping the poor and needy, reconnecting with friends and family, and most importantly, eating. For children in Somalia, it’s also another day of coming to terms with the civil war that devastated their nation. Many kids, ecstatic about the occasion, urge their parents to buy them their favorite Eid gift: toy guns. 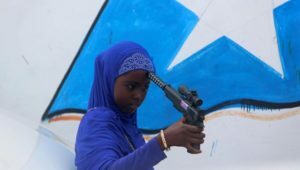 Yet instead of brightly colored pretend weapons, many of the toy guns touted across markets in Somalia are ultra-realistic, and with their silver and black colors, eerily resemble real firearms. And so on the beaches of the capital Mogadishu, the neighborhood alleys of Hargeisa, and outside the restaurants of Kismayo, children caper about carrying with them toy bazookas, AK-47s, and M16s.Toy guns are everywhere. Even three-year-old prince George was recently seen playing with a plastic pistol on a day out with family. But the difference between Somalia and other places is that the Horn of Africa nation has unraveled for decades, thanks to the destabilizing force of guns. The war has completely devastated the country, scattering millions of Somalis across the world. The recruitment of child soldiers is still rampant, attacks on entrepreneurs and safe spaces widespread, and terrorists continue to strike safe spaces. Because of the weak Somali government, there are no regulations or public discussion about toy guns or their impact on society. New York, for instance, mandates that toy weapons must be brightly colored (paywall) or translucent—not black, blue, or silver. Dropping a plastic, nonlethal weapon into a child’s hand in Somalia is also problematic because it associates guns with fun, and inculcates the notion that something designed to kill is normal. Toy guns are not lightsabers, and gifting them to children desensitizes them from a young age on the problematic goal of the tool itself: to harm and end another life. Somalia is a country taking baby steps out of a brutal war, and the last thing its children need for entertainment are toy guns.